A little over a week after debuting the latest downloadable content and a day after the start of the PAX East festival in Boston, Behaviour Interactive has confirmed that Evil Dead character Ashley J. Williams is heading to its hit survival horror game Dead by Daylight with a confirmation video featuring the man himself, Bruce Campbell, which can be viewed in the player below! Released on March 19, the new DLC features a new map entitled the Temple of Purgation, also known as the Red Forest, a new killer named The Plague and a new hero named Jane Romero, but the most notable new additions are perks entitled “Mettle of Man,” “Buckle Up” and “Flip-Flop,” all of which are rare to achieve in game. 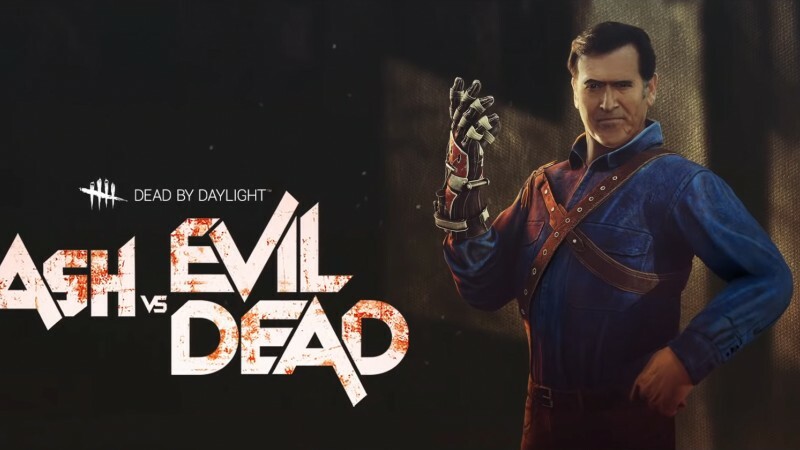 In addition to be references to the franchise itself, the perks are all labelled as the “Ashley J. Williams” perk for the protagonist of the acclaimed horror franchise Evil Dead, in which the chainsaw-wielding hero was portrayed by Campbell (Burn Notice). The perks have so far only appeared in the PlayStation 4 version of the DLC and Behaviour has now confirmed the character as a playable survivor in the game. Ash’s appearance in the game is not the first licensed character Behaviour has added as DLC to the game, as previous additions have included Halloween‘s Michael Meyers and Laurie Strode, Left 4 Dead‘s William “Bill” Overbeck, The Texas Chainsaw Massacre‘s Leatherface, A Nightmare on Elm Street‘s Freddy Kruger and Quentin Smith and Saw‘s Jigsaw pig costume and David Tapp. Dead by Daylight was first released in June 2016 on Windows to generally positive reviews before being ported to the PS4 and XBOX One the following June and to the Nintendo Switch last month.